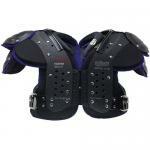 Football Shoulder pads have come a long way and have become more position specific while providing the ultimate in impact protection. 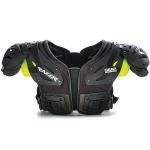 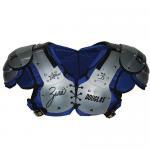 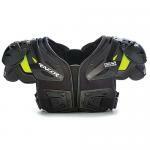 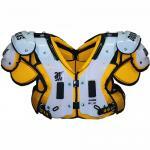 We offer shoulder pads for skill positions and linemen in a variety of youth and adult sizes. 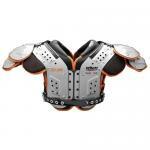 Along with choosing the right shoulder pad for your position, getting the proper fit with your adult or youth pads is equally important. 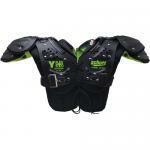 We have been outfitting football players for over 30 years and would love to find what is right for you or your child. 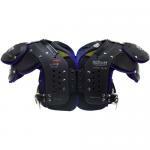 Here are some guidelines when purchasing your shoulder pads. 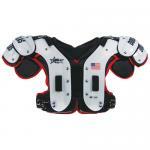 QB/Wide Receiver - Pads designed for mobility, agility, and range of motion with lightweight padding, no excess or heavy epaulets, flexible shell and cushioning and strategically placed padding. 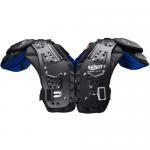 Running Back/Defensive Back - Pads - Similar in weight, flexibility, and range of motion to QB shoulder pads, but with stronger padding and cushioning. 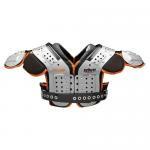 Full Back/Linebacker/Multi-position - Pads designed for serious protection without restricting fast movement, incredibly secure fitting provides solid protection against hits, plated front connections instead of front laces cut down on mid-play adjustments. 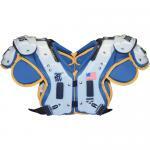 Vinyl buckles give a strong and secure fit under the arm, but can sacrifice adjustability. 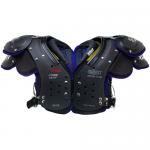 The pads are heavier than QB or RB shoulder pads, but still lightweight for quick movements. 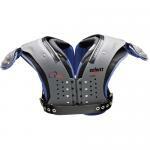 Lineman - Pads designed for ultimate protection against the hardest of hits, they are the heaviest, most durable shoulder pads on the field, but with ample mobility to keep linemen moving. 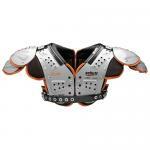 The pads are streamlined with a sleek profile without extra epaulets to prevent the other line from holding onto the shoulder pads.